One of my remote ProPlus clients, Lee (who is, by the way, absolutely killing it in DC, taking to VO like a duck to water – every month, he’s taking the video VO classes, sending in the work to me for review, we chat and he’s chugging right along) had a problem. 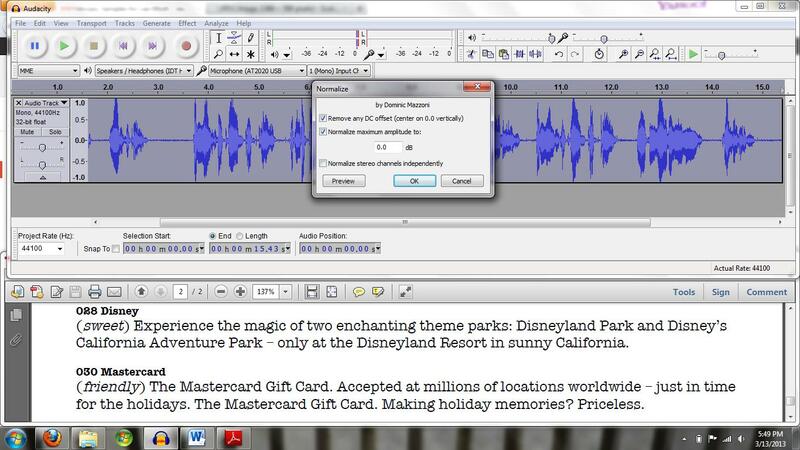 He sent me this month’s homework, and while I was listening, I noticed a lot of unwanted room noise in his recordings. 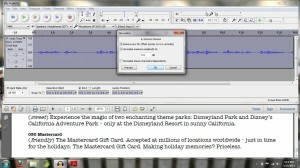 At first, I thought he might have the wrong mic selected in Audacity’s input device settings. It’s pretty common for that to be the case. And that was the clue for me. 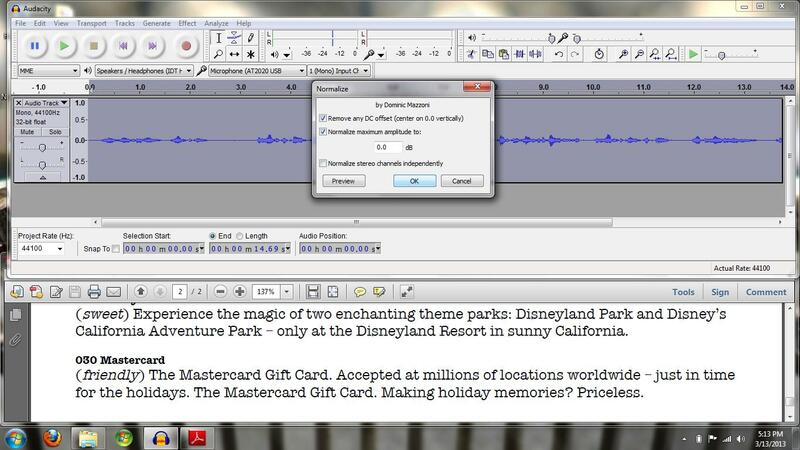 I asked him to record a clip, and normalize it, saving both versions as MP3s for me to listen to. He had his normalization set to 0.0. I like that (I like -3.0 better) – but look at how small the waveforms are in the recording! That means a barely audible sound, and when normalized, the volume will be raised by 10-20 times, and all that room noise is going to be 10 to 20 times louder too. And that was Lee’s problem. Look how much bigger those waveforms are. That means they are much louder (without being distorted) – but the room noise is the same. And it won’t be increased all that much, if at all, when he normalizes the clip. Here’s your takeaway: make sure that you’re recording at a decent level – usually around a 4 or 5 on the scale of 10, but maybe a bit higher or lower. That’s where Audacity has it when you first install it, so you probably have it set that way now – but you should check. And be nice and close to your mic – around an inch and a half or so (three fingers) between you and the mic. Hey David! Always love reading your stuff. I’ll make this quick. I noticed his “normalization” level is 0.0. Shouldn’t it be set to -3 as that’s what sites such as Voice123 require for submissions? No, it shouldn’t. Voice123 suggests that (they don’t require it), and I suggest that they are completely and irretrievably incorrect. I’ll be putting out a 60 SECONDS on this – thanks for the question! Hi David, Thanks for this – always a good reminder to check basics. Wouldn’t better advice be 3-5 inches from a good condenser mic like a Neumann, and perhaps the same on something like a 416, unless doing requiring proximity presence? Most of my students and clients are using the AT-2020 USB or USB Plus. Certainly, individual mics have different sweet spots in terms of distance and in terms of their pickup patterns – in this case, playing the 2020 two to three inches from the wire screen, on a 45 degree angle off axis, is optimal. In any case, not being too far from the mic will minimize the pickup of room noise, and getting closer will, as you describe, achieve progressively higher bass proximity effect the closer one gets. Great reminder, David! What is this “60 SECONDS” thing of which you speak? I haven’t heard of it before. Where/how can I find them? Um, right here? :-) That’s what this newsletter is called. Glad to have you. Yeah, I’m late to THIS party it seems. 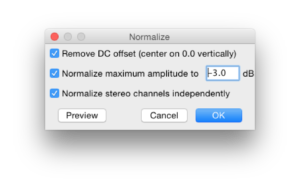 Anyway, I’m using Logic Pro X and can’t seem to figure out HOW to use normalization prior to editing. I’ve searched the internet and can’t really find anything on this topic…any ideas? Go to preferences, advanced tab, turn everything on. Should work then. I wouldn’t really know – there are so many variables here. Are you suffering with high noise levels? Then I’d take a look at the whole chain. But what you’ve described sounds like you’re aware of and are paying very close attention to your tools and their settings. Good for you! David…I use Twisted Wave. I’m not familiar with any adjustments that are available in recording volume that will similarly decrease the level of room noise when normalizing. Thoughts? It doesn’t matter what software you’re using – it matters that the input level on that software is matched appropriately with the output level of whatever’s feeding your mic signal to the computer (mixer, bridge, the USB mic itself, etc) and that you’re not underdriving the input. As long as you’re recording at a healthy level, you’re fine. It’s when you are recording at an extremely low level that you bring up a huge noise floor when you normalize. David’s got the right idea, it’s all about signal to noise ratio. However, the AT2020 USB can only change gain from the software, whereas other systems and USB mics have proper mic gain controls. In Windows 7 and above, be careful not to set the gain in Audacity much higher than 1 or 2 out of 10, otherwise you’ll find you have to run the gain on the mic preamp very low, which will in turn hurt the signal to noise ratio. Whenever possible the gain should be the highest at the “front end” closest to the source for best results. Thanks for stopping by, again, George! I respectfully disagree about there being “proper mic gain controls” on other USB mics – other than the Yeti (please, no – I beg you), commonly used USB mics don’t have output level controls – certainly the Snowball, the Beyer-Dynamic MMX line, the Samson C01U (none of which are appropriate for VO work, but artists cheap out and buy them) and the Apogee MiC (very appropriate, but more expensive than the AT2020 USB Plus) don’t have any such control – you have to use the input control on the software (we usually refer to Audacity here, but any software will have input gain controls). I do agree that you have to be very careful with the newer versions of Windows (7 and above) that have added a layer of control (and therefore latency) between the hardware sound controllers and the software that runs them. It makes for a very finicky audio recording and editing environment.